We charter boats in Turkey every other year with our group of friends we refer to ourselves as The Dudes. 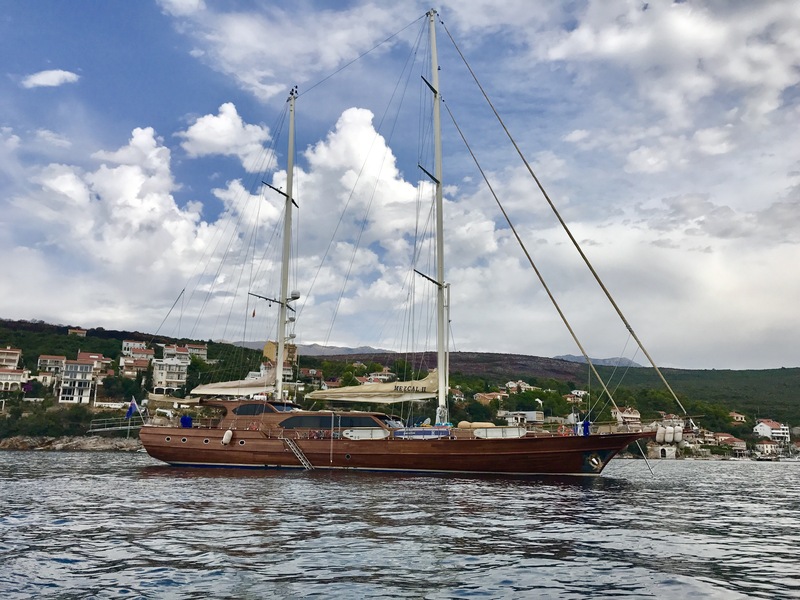 This year we had the charter broker bring the boat up to Montenegro with the thought that we would cruise the waters of Croatia. 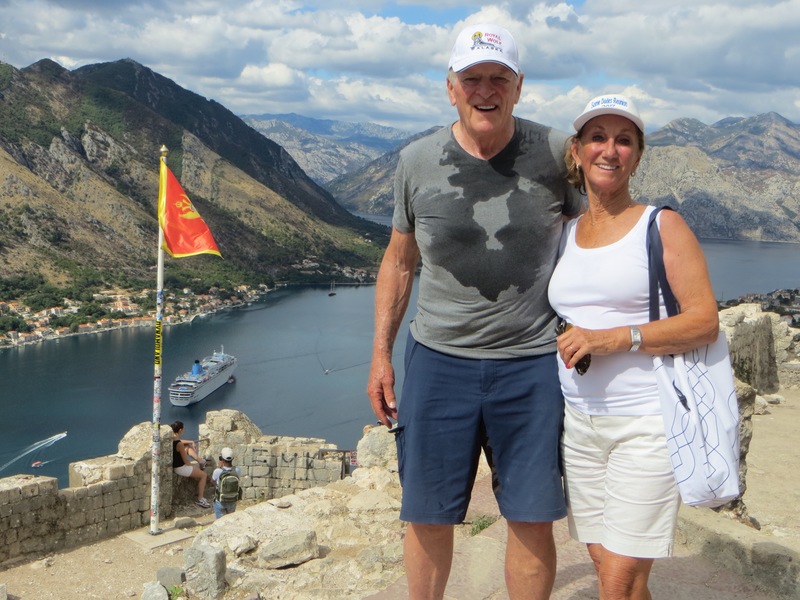 We flew into Dubrovnik and had a car pick us up to drive us to our hotel in village of Tivat, Montenegro where we picked up our boat. We spent the first night at The Regent Porto Montenegro, a beautiful new resort with a huge marina and shopping village. The hotel has several pools, spa and the waterfront has many fun restaurants to choose from. We had dinner next to the hotel at a good Lebenese restaurant, BYBLOS, everything we ordered was fresh and beautifully presented and not expensive. The next day we had some shopping in the local village and sat by the pool until we could get on our boat at 4pm. Once we got settled onboard our captain told us he was not given permits to go to Croatia so we would only cruise Montenegro. There are often things that are out of your control and we had to just go with the change of itinerary and enjoy the next adventure. The airline had lost our luggage on the flight over a few days before so we were already wearing the few things we found in Tivat at little shops. The water in this area is not as warm as past cruises and we expected a few big rain storms so we got our books out and poured our first glasses of wine. The crew was great and the chef did an amazing job. The first night we anchored out not far from Tivat. The next day we cruised along the shore going south to a small bay and village of BIGOVA. We went to shore took a hike and got caught in a big thunderstorm. 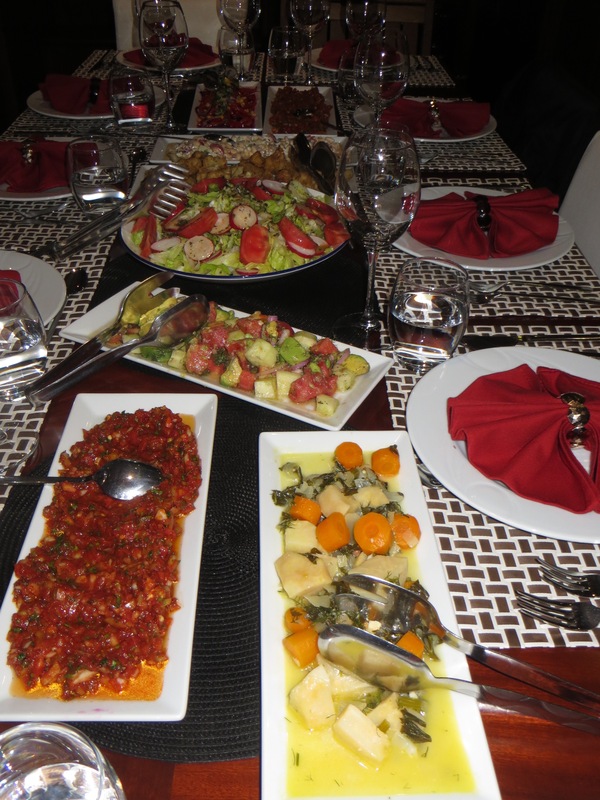 When we returned to the boat the chef had prepared one of our many course meals of fresh vegetable salads, fish and homemade bread. The next morning we went south to BUDVA the most popular tourist town in Montenegro. 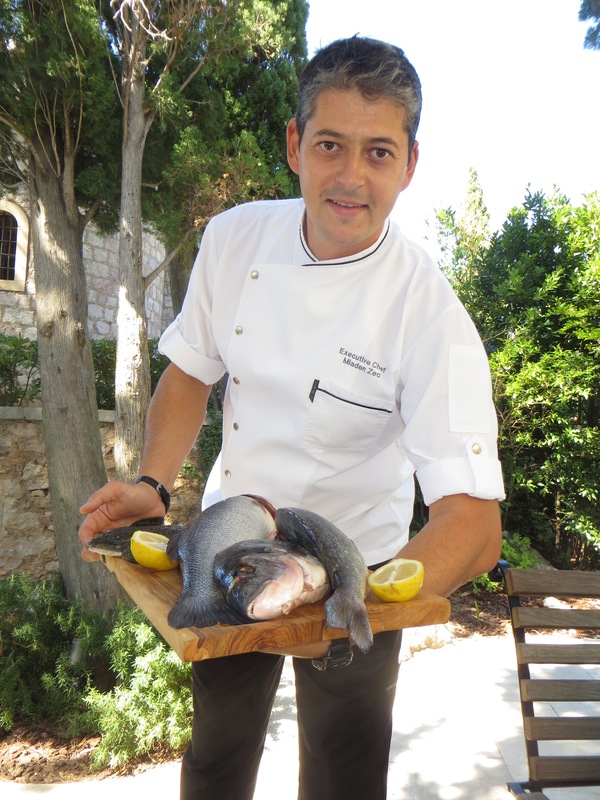 We made lunch reservations at the AMAN resort at SVETI STEFAN. This resort is two separate properties one on the pink sand beach and one on the small island that they have totally redone. We are on the top of the island then took the grand tour so we all marked on our notes to come back and stay. 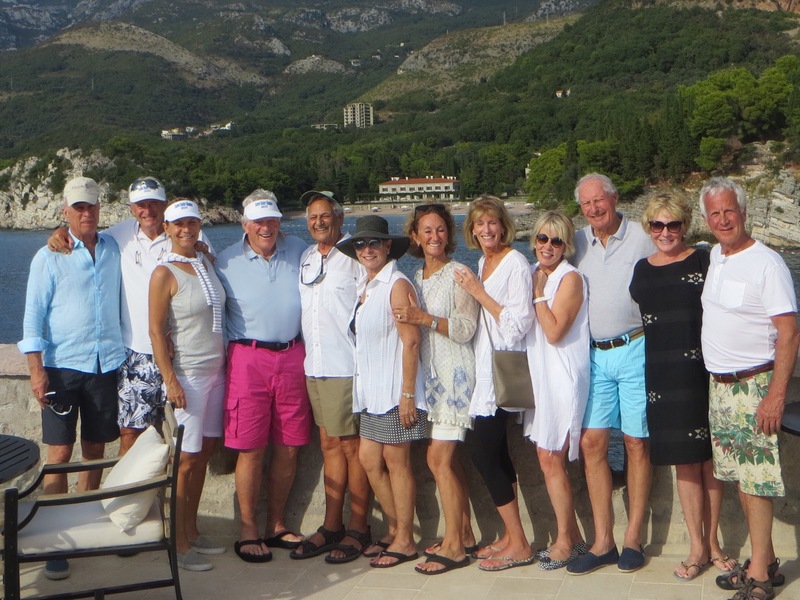 We spent the night anchored in the bay and the next morning we to shore in BUDVA. The old walled city has been well preserved, but of course the narrow streets are full of tourist shops and little restaurants. The newer area outside the old city has long beaches full of people sunning themselves and the beaches are lined with restaurants. We went back to the boat after a few hours and had the best lunch in town served by out great staff. We cruised north again to the bay of Morintsley this area has a great amount of history from years of war and the high mountains coming down to the water makes for dramatic scenery. We spent most of the next day n the lovely village of KOTOR. Carl and I hiked to the top of Castel St. John Illyrian Fort, it was 11,685 steps according to our watch counter. When we got back into town we met the rest of the group at a wonderful waterfront restaurant Galion. Montenegro is famous for the mussels they raise in many mussel farms. We ordered them and they did not disappoint. A great day from start to finish. Later some of the group decided to try out the water sports and a swim, but the water was very cold. The next day we took a transfer to Dubrovnik for our flight out to Amsterdam for the night before we headed home. We stayed at the Sheraton Amsterdam airport hotel. It is connected to the airport so it is easy to board the flight in the morning. The hotel has a good restaurant, so if you get in late and do not want to go into the city it is a good choice. Tip of the day–the herbs have gone crazy so I have been cutting them and drying in my warming oven. turn the oven to 150 degrees and place the herbs on a piece of newspaper. I leave them in the oven about 4 hours and then use my hands to rub them from their stems. I have bags of dried tarragon, thyme, oregano,mint and stevia. I do not dry my bay leaves that way since they turn a brown color. they are best just hung to dry. When you plant Lovage be sure to trap it in a container because it will take over an area and it is hard to dig out. Reminds be of planting bamboo. I like to add Lovage to potato soup as it simmers, tie it with string so it is easy to remove. It give the soup a wonderful mild celery flavor, served hot or cold. .
My herb garden takes up most of the front area of our house so it is easy to keep watch over it’s progress. This year has been warm enough that many of my herbs made it through the winter and are going crazy. since I can only use so much to cook fresh I have been cutting like crazy and drying in my warming drawer. I set the temperature on the warming drawer at 150 , lay the fresh herbs on a newspaper and close the drawer. The heat will shut off in a couple of hours, I leave the herbs in for the night and in the morning has perfect dried thyme, rosemary and tarragon. The rabbits are quick to eat the Stevia when I frist plant it so you have to use repellant or it will be gone by morning. Note on Lovage—-Lovage grows like a weed and needs to be contained very much like mint and of course bamboo. I stuff chickens with Lovage, tie a hand full with string and add to my potato leek soup while it simmers. Discard the lovage, before you puree the soup, serve hot or cold but you will love the flavor of the lovage. It is April first in Seattle and time to start planting. We will plant peas, radishes and lettuce this week-end. We are planting 3 types of peas, first a shelling pea called Sienna and an early shelling pea called Strike. Next we plant a short row of snow peas or often know as sugar peas and pea pods for those stir fry dishes and salads. We will seed the peas closer than normal so I can pick about a third of the plants when they reach about 6 inches high, this gives me those tender pea shoots for stir frying. This will be the first planting of peas since they will be ready in 49 to 60 days. We will seed a second planting in about 3 weeks so we have a longer harvest period. Be sure to soak your pea seeds for at least 12 hours in a glass of water before planting, this will help them sprout faster. A peas root nodules are very high in nitrogen, this is why you do not want to thin the peas. When we double plant for the harvesting of the pea shoots I only pinch off the tender shoots and leave the roots in the ground. The nitrogen released from pea roots helps increase the yield of the pea crop but also the next crop you plant in the ground when the peas fade. We had a great harvest of garlic this year and now have taken all the dirt off, removed the leaves and placed the heads in seperate mesh bags. 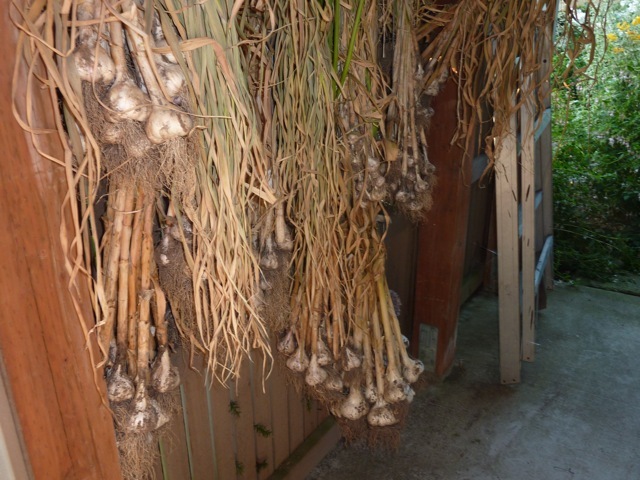 We allowed the garlic to hag in a dry cool place for about 6 weeks before we removed the leaves and roots. Found the bags at Whole foods and they are made of cotton so should keep the garlic dry and free of mold. I have seperated the types and will report as we start to use each type. A good web site is Peaceful Valley at, groworganic.com, some of the best types are as follows. Purple Italian, Georgian Fire, Purple Glaze, California Early White, Music and Metechi. Each one of these types has a different flavor and size clove. 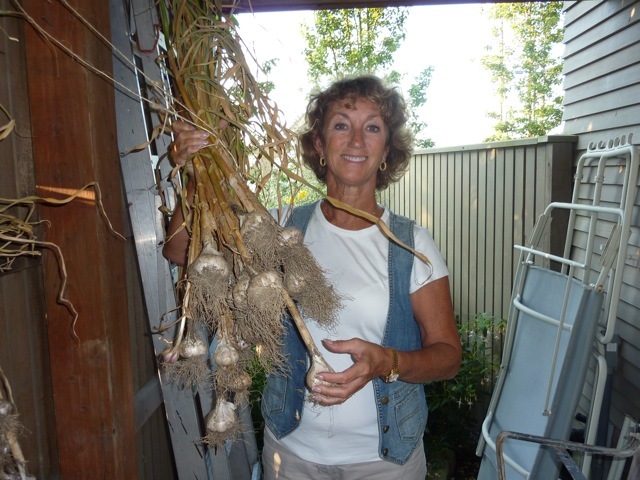 It is close to the time to plant your new garlic so order now and enjoy next fall. Tagged as 10/9/10. Planted new garlic today and will add about 4 inches of compost next week. We will order mushroom compost from Tacoma compost. I worked on the herb garden this week-end. We had a mild day and since I had lost several of my rosemary plants and wanted to replace them. It is time to sow the seeds for my parsley hedge, I did half flat leaf and half curley leaf. It is strange that I also lost 3 of my large sage plants that were 3 years old. I guess the hard frost we had in Dec. took them out. Carl planted bush peas and I planted red cabbage starts and lettuce starts. We put in Chard seeds and hope they will come up. The garlic that we planted in October is about 8 inches high. We still have some left from last year so I am trying to work my way through before it starts to sprout. Now is a great time to clean out your herb pots and get planting.